better than with me in front of it! 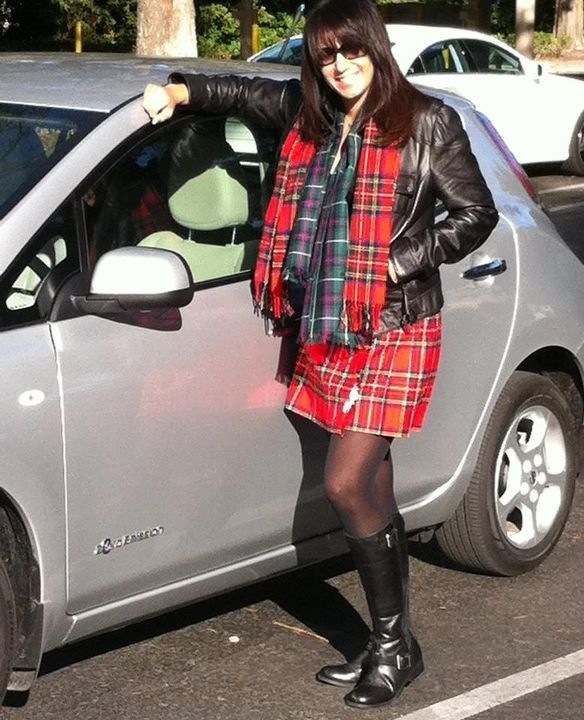 After 20 months of waiting for my Nissan Leaf, I finally took delivery on December 22, 2011. I leased a 2012 Brilliant Silver SL, which it turns out is the most popular Leaf color. I've never waited for anything that long...not to get married...or even to get out of Mom's womb, so my expectations for the Leaf were very high. So now that I've had it for two months and 2,500 miles, I feel it's safe to say that: It's better than I expected! Why? When stopped, the Leaf makes no noise and does not vibrate since there is no engine idling. From 30-55mph, I can hear a non-obtrusive high-pitched drivetrain whine...which sounds kinda cool to me. After 60mph, I can hear tire and a small amount of wind noise. Overall, the Leaf is very quiet. Because they are so quiet, electric vehicles like the Leaf are going to raise the importance of quality sound systems (not just loud systems). Even though the Leaf doesn't have a premium sound system (no subwoofer/center speaker), it has great imaging and decent bass. My favorite progressive bands (Tool & Traverser), as well as my favorite high fidelity jazz band (Flim and the BB's) all sound great...at any speed! Since the Leaf's climate control works without an engine spewing out toxic fumes, you can listen in comfort...even in a closed and cold garage! Acceleration is all about torque...and electric motors can dish out lots of torque at any RPM...instantly...with no need to rev up or switch gears. The Leaf's pickup will surprise you. The Leaf is fun in corners. The 660 lb lithium ion battery pack that is in the floorboard keeps the Leaf flat in corners. Together with the instant torque and lack of a gearbox, you get acceleration exactly when you want it when exiting a corner. The car can easily pass another car at 60 mph and has good pickup all the way to 95 mph (feels like it's speed limited)...it's no golf cart. Because it's so quiet, "spirited drivers" can now hear something very important that's been masked by internal combustion engines - the tires! With the Leaf, you can hear the tires howl as you push them to losing grip. This makes driving more fun since you get more feedback from the car before something bad happens...it's a big plus. It's Efficient and Cheap to Operate. My first 1,000 miles cost $36 in electricity and my second 1,000 cost $28. Compare this with the $190 I was spending with my 20 mpg internal combustion engine (ICE) car at $3.80/gal...and that price is going up! That's a 6.5X difference in price! Once you get past the low fuel cost, the maintenance requirements for a Nissan Leaf are tiny compared to an ICE car. This means I waste less personal time taking my car to the mechanic too. Check out this article from Consumer Reports. Regenerative Braking Rocks - The biggest surprise I got from driving the Leaf was seeing how much energy the regenerative braking system created during any given trip. Ready for the answer? The Leaf generates between 20% & 40% of the energy I use on my average trip...with an average of 24%!!!! That's a huge efficiency gain...and something that is impossible in an ICE car. It's Cool...Literally! I've driven home via the freeway and parked the car in the garage. I can immediately get out of the car and touch the front brake disks and open the hood and touch the motor and not get burned. The Leaf's motor is very efficient at delivering power to the ground...and picking it back up again with it's regenerative braking. This efficiency WILL translate into lower home A/C usage in the Summer since the Leaf won't be heating up my garage when I get home. Home Charging beats Gas Stations any day. I installed a Schneider EV2430WS EVSE in my garage and it takes me 10 seconds to plug in my car on my way in the house...I certainly don't miss pumping or smelling gas. 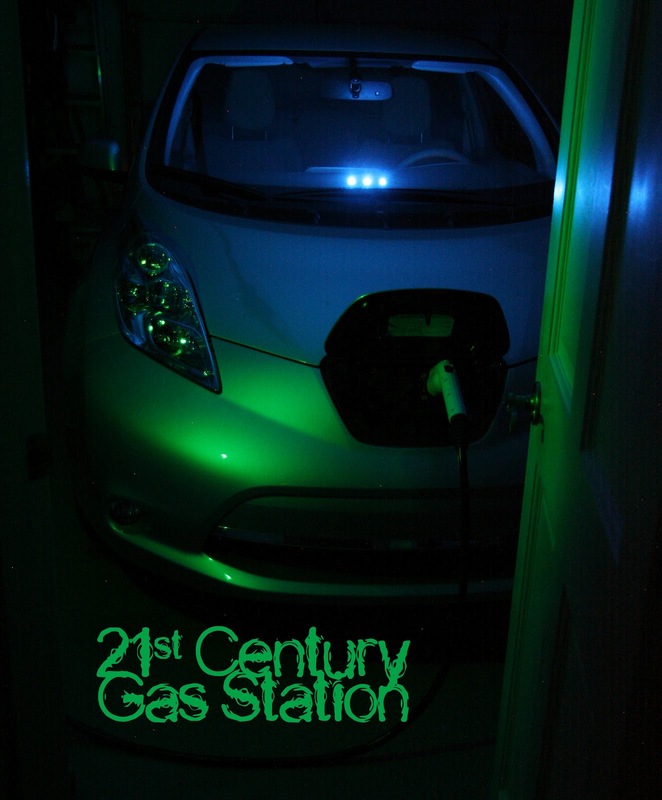 It takes about 3 hours to recharge my car at night from driving it 40-50 miles...which is about $1.20 a day. 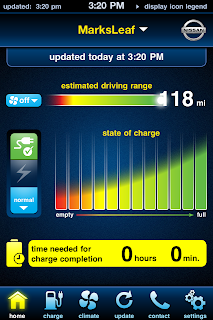 When I'm on the road, finding charging stations is easy with the Leaf, as it displays them on the GPS display. When I get a low battery warning, it pops up nearby stations and asks me if I want to be routed to one...easy. However, what it won't tell you is if the charging stations are currently being used. 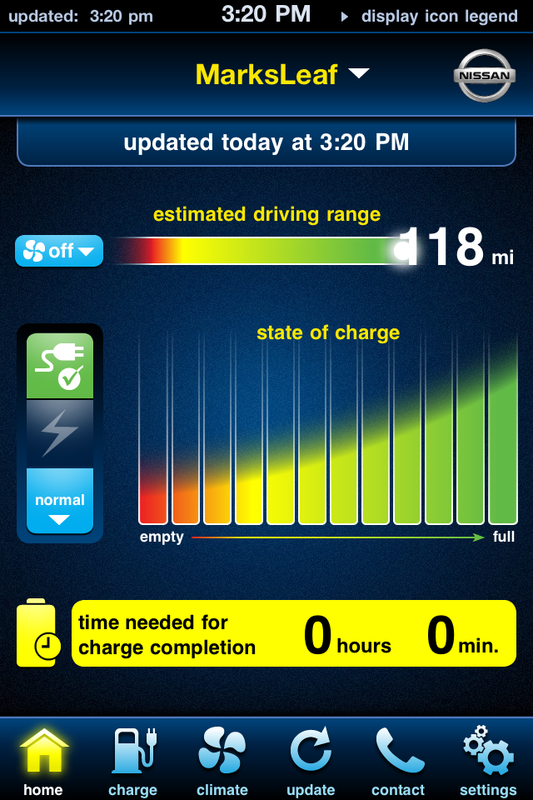 For realtime availability information, you'll need to use a ChargePoint or Blink app on your Smartphone. It's a great feeling driving a car that pollutes so little from so many points of view: gasoline, carbon (COx), engine oil, radiator fluid, excess heat, brake dust/pads, and noise are all significantly reduced with the Leaf. Even if I was in West Virginia and charging my car with 97% coal powered electricity, the Leaf's fuel would still be cleaner than burning gas. Before I talk about range, you should know that I live in Florida, which is flat and temperate...especially during this time of year (Winter) when I don't have to run the AC or Heater. I'll update this post later in the year when I'm always using the AC. 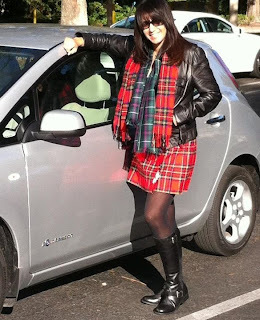 City: The Leaf loves traffic - I frequently get 5+ miles/kW when driving in typical city traffic with 25-55 mph streets...which allows me to get 100 miles of range. In the City, the Leaf's regenerative braking system works to give me back 20% to a whopping 40% of the energy that I use on that trip. I use the Leaf's ECO mode which increases the regeneration effect and causes the Leaf to slow down quickly when I lift my foot off the accelerator...which means I don't have to step on the brake so much in traffic. Highway: Given that it takes more energy to go fast, the Leaf's range mainly depends on how fast you go. On the highway driving aggressively (65-80mph), I frequently get around 3 miles/kW, which reduces my range to 60-70 miles. My average energy economy for both city and highway driving is 4.6 miles/kW which gives me a 110 mile range when it's fully charged. Conserve on the way out, have fun on the way back. On my way out to my farthest point of the day, I drive efficiently using the rules below to make sure I conserve my available range. If I have more than half charge at that point, then I have more "spirited" on the way back. Drive under 65mph...as speed kills your range...exponentially fast. That's why the Bugatti Veyron only needs 270 hp to go 155...but it needs 1,001 hp to go 253mph. Slow down slow and start braking early...which lets the regenerative braking reclaim as much energy as possible. As soon as you see red lights in front of you, get off the accelerator. Shifting to ECO mode will help you get the most regenerative braking out of the Leaf. Accelerate slowly...especially from a stop. Shifting to ECO mode will help you do this. To help you drive efficiently, the Leaf has a simple "ECO" indicator on the upper left side of the dashboard which shows you how you're doing in real time. It takes into account your accelerator use, brake use, driving conditions, traffic conditions, and heater/AC usage to give you a real time gauge on efficiently you're driving. If you keep driving efficiently, you'll slowly build trees. You can see how many trees you've built using CARWINGS...I've built over 173 trees in my 2,500 miles. I drove 35 miles New Smyrna on the Florida coast one nice Sunday to visit a new Fisker Karma owner (my company installs for Fisker and GM)...and then I took a drive along the river for another 30 miles. When I was ready to start my 37 mile trip home, I only had 25 miles of range left. I drove over to my parents home and plugged in to the wall for 2 hours and added 14 miles of range...37 miles of range for a 37 mile trip. I set my cruse control to 45 mph and drove home on barren county roads and I made it home with 14 miles of range left...proving that you can greatly increase your range by slowing down. This trip gave me lots of confidence to know that I can extend my range if I need to. However, if I get over-confident, there's always AAA's roving Level 3 charger in Tampa (soon in Orlando)! CARWINGS portal showing my first month of driving. Bluetooth Audio: I love being able to listen to the music off of my iPhone without touching my phone. I hear no sound difference between Bluetooth and "hardwired" connections. I also don't notice a big drop in battery life on my phone when paying music via Bluetooth, so that's all I do now. Prewarming/precooling feature: You can remotely (with the iPhone app...or set a timer) turn on the climate control system to cool or heat the car to 77F (fixed setting). I used this feature a few times this winter and it's great getting into a warm car on a 40F morning. I'm sure I'll love the feature in the Summer after my car bakes in the Florida sun all day. Google Map Integration: When you're viewing a "place" on Google Maps, you can select to "send" it to your Nissan Leaf. When you get in the Leaf, you can easily download the location to the GPS and set it as a destination...saving you from having to use the Leaf's Nav system to look it up. Here's how to do it. CARWINGS: CARWINGS is the telematics system made by Airbiquity that the Nissan Leaf uses to allow you to remotely control your car (e.g., iPhone App) and show you how you've been driving your Leaf (CARWINGS internet portal). 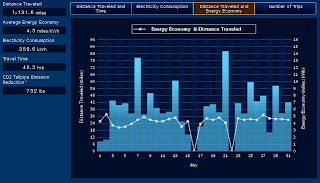 The portal does a nice job of presenting my energy usage...it's simple and easy to understand. CARWINGS also shows me how my driving stacks up with other Leaf owners. Smartphone control. I'd LOVE it if I could hold down the Phone button on the Leaf's steering wheel and it would trigger Siri on my iPhone...just like what happens when I hold down the button on a bluetooth headset. The Leaf's voice activated phone support works OK, but it's obsolete to me with an iPhone. 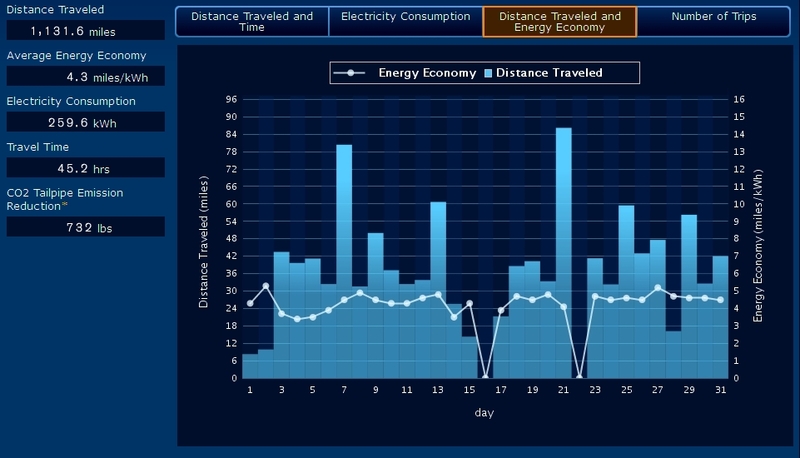 Energy Economy History should show info from your last few trips vs. making the driver save the data. I'd also like this screen to show up when shut the car off each time to show me a comparison of my last few trips. Ditch the Shifter...that's where my smartphone plugs in! I'd rather move the shifter to the dash and use the real estate for a place I can plug in my Smartphone and get a charge. Non-Shocking Seats. While I love how the fabric for the seats are made from recycled water bottles, I HATE getting shocked each time I get out of the car when the humidity is dry. Can't Nissan weave in some semi-conducting fabric so this doesn't happen? More Control over Regenerative Braking. I'd like to be able to quickly change the amount of regenerative braking that happens when I lift off the accelerator. Switching ECO mode is OK, but I want more control when I'm in drive. I like what VW is addressing this control. Remote Charge Port Door release. One of the features on the Volt that I love is to be able to open the charge port door from the remote. Certainly not a must have feature, but it would be nice. Heated steering wheel and seats don't stay consistently warm. They seem to be on a timer where they will get warm and turn off until they get nearly room temperature...and then warm again. How about a consistent temperature? Heated seats on a "soft switch". I would rather have the switches for the seat heaters to be the type to reset to off when you power off the car. Having switches like this would ensure the heaters were not left on and wasting energy. The horn is wimpy. Please swap for a nice 2 tone horn. Easier Access to CARWINGS. I currently have to log into Nissan's Driver's Portal to open CARWINGS. I'd like it if I could open CARWINGS directly on my browser and also have access to the information from my Smartphone. I love my Nissan Leaf, it has exceeded my expectations. It's quick, quiet, clean and very efficient. By the time the general public seriously considers owning an EV (2014? ), the most limiting thing about the Leaf...it's range...will be doubled, making it an easy choice for most suburbanites. By that time, most people will have had the opportunity to drive one or know someone who owns one...so they can make their own decisions. You really need to drive one to understand how nice they are. In California, our Leaf nav system shows only one charger at the local Nissan Dealer. The next closer one according to the Leaf is the Nissan dealer 29 miles away over the mountains. So far, the best charging resource is our smart phone with access to ChargePoint, Blink, Recargo, etc. We are hoping that Nissan's database vendor gets up to speed soon with all the available locations. Great summary! Both the good and not so good. Our LEAF will celebrate its first birthday this month, and we've put on 11,000 oil free miles. I've got a heavy foot even though I'm almost always in eco mode so I'm ONLY averaging 4.1 miles per kW-hr. A terrific summary. I am in NY and have had the Leaf for 2 months. Great suggestions on how to increase the efficiency and driving range of the car. Great comments. I leased a Leaf 3 weeks ago and everything you experienced i did too. Now, that you have the car for a while, can you tell me if you noticed a decrease in the battery capacity, consequently a lower range. After only 3 wekes I noticed a lightly faster discharge. Thank you! Good for you that you're having good times with your Leaf. It's one of those rough-and-tough electric vehicles that really need a little more love because it's really reliable, as long as you get accustomed to its quirks. So much for making for an efficient and cheap ride. I'd probably spend just as less if I drove a used car for just three times a week. Thanks for the review! Your reasons are pretty much the same as anyone else's, when buying electric cars, but thanks for elaborating each of it! I want an electric car too, and so far, Nissan has the most number of positive reviews I've seen so I think I'll settle for it. I just hope automotive companies keep on producing eco-friendly vehicles that would help modulate the pollution all over the world. Also I think this would be cheaper. Sounds good enough, though I heard it's a little expensive. Bust basically, based from your feedback, it's a pretty decent car. I like how the leaf approached the need for a reliable EV the way it did. It's multifunctional and easy to use and recharge. I'm wondering when Nissan will start making high-end EV's though. I hate the speed-to-consumption problem EV's still have. I wish car makers can finally make a way to have the power consumption a bit lower while not sacrificing speed or cruising range for the car. The only knock on electric cars is the price. If the manufacturers would make them more affordable while upgrading the battery then the switch would be easier. They should also offer trade ins or changing fuel based vehicles to electric ones. aweSome summary. i live in FlOrida too and am getting about the same range doing 71 miles round trip five days a week for my commute to/from work. put about 1800 miles on my car in about 28 days. which used to cost about 240 a month in my 4 cylinder accord. cost about 30-40 extra on my electric bill (i charge back to 100% at work for free) use about 7 out of 12 bars driving aggressive at up to 75mph highway speeds on the way to work since i charge free there. that's 38miles probably 5 or less are city miles. i get there with 4 or 5 bars and get 6 bars back when trickle charging on 110v for 8 hours so that's am 83%-93% charged battery. and then i take the city back home (33miles) at 35mph to 55mph uses about 5-6 bars (range usually says i can do 45 ish more miles. that's pretty damn good. love this car. black 2012 sl. p.s. you should get one. you'd be pleasantly surprised. I have the 2013 Leaf SL which has a lot of the upgrades the OP requested. I am averaging 3.4 kwh that is driving way over highway speeds daily on my 30 mile journey to work and back. The car is fast or faster than most V6 cars out there it will smoke 4 cylinder and I can out run most V8 Suvs. The handling is excellent. I also drive a 370Z Nismo so I know a little about handling and speed. The leaf is an excellent hatch not cheapo econ car. The doors are solid the ride it solid the interior is solid comparable to BMW if not better. AC/Heat are off the charts. The car is tough and can handle tons of abuse. I enjoy having people try and keep pace with me and I laugh at them while they burn away all there fuel at almost $4 a gallon while I cruise at .002 cents per mile. I have already noticed a huge savings per month. I have even eliminated the cost of the electricity that use to charge the car by killing all the vampire equipment in my house and programing my thermostat for normal settings. Next are solar panels for the house roof to cut those energy bills even further.